Well, we’re back from our travels across England and Italy. We had a smashing time and would like to thank everyone who helped us to arrange the gigs and came out and cheered for us like thuggish hooligans. You are special to us in ways we can’t even begin to explain. THANK YOU! But now we’re back in sunny Pittsburgh and looking forward to our next luscious band gig. Here’s a fancy poster Joel whipped up. See it? This THURSDAY at Club Cafe we’re on stage at 8pm. 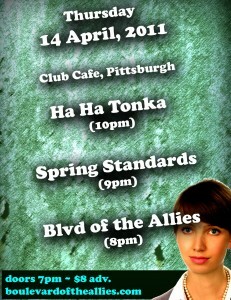 Stick around for The Spring Standards(9pm) and headliners Ha Ha Tonka(10pm). Email joellindsey@gmail.com to arrange advance tickets or buy tickets online here. Come to this show – it’ll blow your pants out!! If you can’t do it, check out our other gigs here.